Linndale Police have arrested a 15-year-old boy for attacking and trying to abduct a girl after getting off a RTA bus, after school. 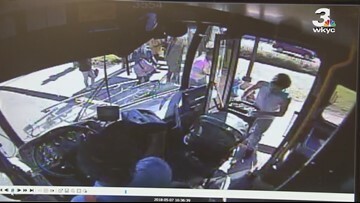 The surveillance video from the RTA bus shows the moments leading up to the attack. Police told Channel 3 News that the incident happened last Monday near the intersection of West 120th Street and just south of Bellaire Road in Linndale. The suspect was arrested five days later on Friday. Police said the victim is a also 15 years old. She reported to police that her attacker grabbed her from behind. She fought back and ran to the Linndale Police Department. Police said the suspect is a student at Rhodes High in Cleveland. When we reached out to CMSD, but the spokesperson declined to comment, referring us to police.